Four unique and delicious organic hot chocolate flavors blended by Scout Urling using the finest ingredients. When Scout Urling is sourcing ingredients for her exquisite drinking chocolates, she is uncompromising: only the finest will do. Her deep knowledge of botanicals and unerring sense of taste enable her to blend them into original combinations that thrill even the most jaded palates. Handcrafted with organic, sun-dried, heirloom cacao, lightly sweetened with sundried cane crystals and pure ground vanilla bean, and complimented with flowers, herbs, and spices, this chocolate is to be sipped and savored. Whether on a crisp clear morning, a rainy afternoon, or cuddled up by a fire, these scrumptious blends offer you a chance to indulge in the divinity of chocolate. Handmade in Bellingham, Washington. CACAO ESPECIAL: Heirloom cacao, pure vanilla bean, and sundried cane crystals. 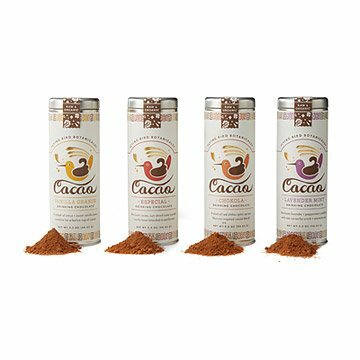 CACAO CHOKOLA: A dash of local red chiles spice up this Mexican-inspired cacao blend. CACAO LAVENDER MINT: Heirloom lavender and peppermint combine with raw heirloom cacao, pure vanilla bean, and sundried cane crystals. We spoke to Scout about about becoming a business-owner, the goddess Athena, and the power of animal puns. Read the whole story on our blog. Scout Urling graduated with a Bachelor of Science in pre-medicine, and then began studying herbs, via traveling, apprenticeships, and independent research. She started making tea blends as a hobby. When demand for them snowballed, she decided to turn her teas into a real business. Having worked on local organic farms throughout her college career, it was natural to partner with those farmers to source her ingredients. Her search for the freshest, highest quality botanicals led her to cultivate similar relationships with small tea gardens and growers around the world, enabling her to begin offering caffeinated teas and chocolate as well as her original herbal teas. Pour 8 oz of hot water or milk over 1 heaping tablespoon of cacao and stir. Approximately 14 cups of hot chocolate per flavor. Perfect gift for someone who wants to try something new. I love this gift set! My mom loves hot chocolate, and I wanted to get her something so that she could try new flavors and mix and match. All the flavors are unique and delicious, and I love that all the ingredients are organic. On top of all that, the canisters are beautiful, and they come wrapped in a simple box which is perfect for gift giving. I was planning on giving these hot chocolates to my friend for Christmas. Very good gift set that is unique. It was a very nice and unique gift. Flavors were perfectly complementary to the chocolate, not too sweet (you can always add more sugar if you want). So happy I got this as a gift. My new favorite! The unique flavors are what drew me in, but they are poorly executed. Although there is salt in the ingredients, I think there isn't enough. The overall impression is a flat flavor, for all four. The one pro is that they are perfectly sweetened. Not too sweet. I just get a bland sense of taste. I wouldn't repeat this purchase. This is rich with dark chocolate flavor. If you are looking for a sugar laden product, this is not it.